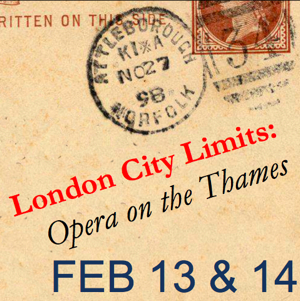 An opera for St. Valentine's weekend! Image: A promotional graphic for Dido & Aeneas, courtesy of SDSU Opera. And it's not just any opera; it's created (by Purcell, et al.) for 17th-century England and then re-purposed for you! You'll understand when you see it. Meredith (Ruduski) is the producer (and one of the six singers) and we have been planning a lovely and loving tribute to Purcell's music in a very non-intimidating manner. We hope you had a sweet, lively, restful, meaningful, I-just-want-some-time-off, tasty, football-filled (or not), Force-filled (or not) musical, let's-get-on-with-the new-year-already, enchanting Holiday season, no matter what you call it! Thank you for your support with those end-of-year donations! You keep us going, you know! Here is more news about the February opera! The next stop on our Eurotour includes the stages and opera houses of 17th-century London as we pay homage to Henry Purcell, one of the most important composers in the history of music, with a comedic-yet-tragic, dramatic-yet-hilarious pastiche of beautiful Purcellian operas as well as some extraordinary gems from his predecessors Robert Johnson and Nicholas Lanier, who were pivotal composers in the earlier 17th century. Our tale, which will surely touch both your heart and your funny-bone, will be performed by a small period orchestra and six of TEMP's acclaimed soloists. The best opera tells a story that is, if not totally (or even the slightest bit) believable, at least is one that we can connect with—either through the characters or the music. With this in mind, we weave a plot around music from Purcell’s operas The Fairy Queen, King Arthur, Dido & Aeneas, The Tempest, and some of his songs and dialogues. Our lively, witty, and loving pastiche of beautiful music contains some of the most popular and should-be-popular works from the world of early Baroque opera. Some of the leading lights of early music, rising stars from New York Peter Walker (baritone) and renowned countertenor Ryland Angel, join TEMP core members Jenifer Thyssen & Meredith Ruduski (sopranos), tenor Jeffrey Jones-Ragona, and baritone Brett Barnes for this unique production. Violinists Stephanie Raby, Bruce Colson, violist Bruce Williams, Jane Leggiero (cello), Scott Horton (theorbo), and Austin Baroque Orchestra director Billy Traylor (harpsichord) comprise the period orchestra. As an early Valentine present, treat yourself and your sweetie(s) to the beauty, brilliance, and passion of some of the most accessible opera excerpts in an intimate setting. We’ll tell a story that will warm your heart, make you laugh, and put your toes to tapping. The passion! The jealousy! The love! Will there be a happy ending? We aren’t sure, but there will be no recitatives and there will be super-titles! On the Fifth Day of Early Christmas My Direc ... Wait! What is that Odor? Do you remember in “Independence Day” when Will Smith’s character was dragging an alien invader through the desert complaining about how the attack was ruining his July 4th holiday, oh, “AND WHAT IS THAT SMELL?? ?” A little pummeling followed. Click to buy tickets for our Christmas concerts on Dec. 11, 12, and 13!